Cruise on wooded trails through coastal communities. From the vibrant city of Halifax to the charming, colourful town of Lunenburg, this shared use 119km trail is an easy, flat ride on a former rail bed. An amazing adventure to coastal communities awaits. 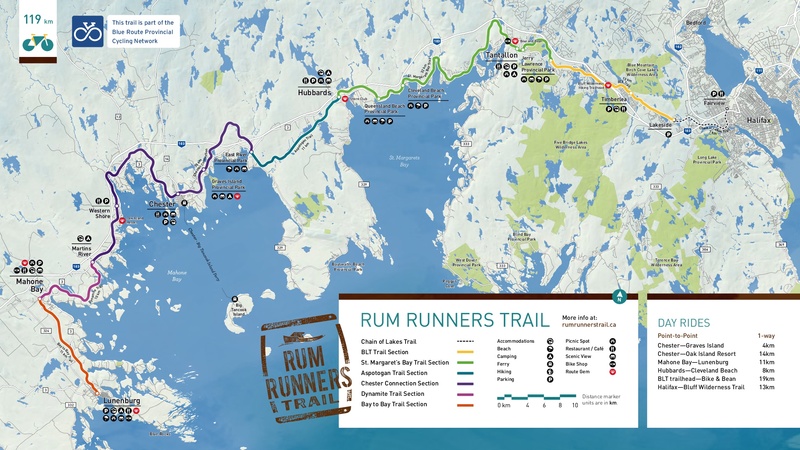 Constructed along the former railway from Halifax to Lunenburg, the Rum Runners Trail links seven easy to explore, shared-use trails comfortable for riding on hybrid bikes. Trail access in Halifax begins at the Chain of Lakes Trail (km 0) (Trailhead – Joseph Howe Drive, across from the Atlantic Superstore), a paved trail with smooth pedaling alongside a series of lakes. The Rum Runners Trail officially starts with the Beechville Lakeside Timberlea Trail (BLT) (km 8), where the trail surface becomes hard-packed crusher dust. The Bluff Wilderness Hiking Trailhead (km 13) can be accessed off the BLT, which opens up to 30km of looping lakeside wilderness hiking trails in Timberlea. The St. Margaret’s Bay Trail (km 21) section hugs the St. Margaret’s Bay and runs parallel to coastal Hwy 3, with roadside access to five beaches. Cleveland Beach Provincial Park (accessible by road at km 44), which has toilets and picnic tables, is a good spot for a swim. 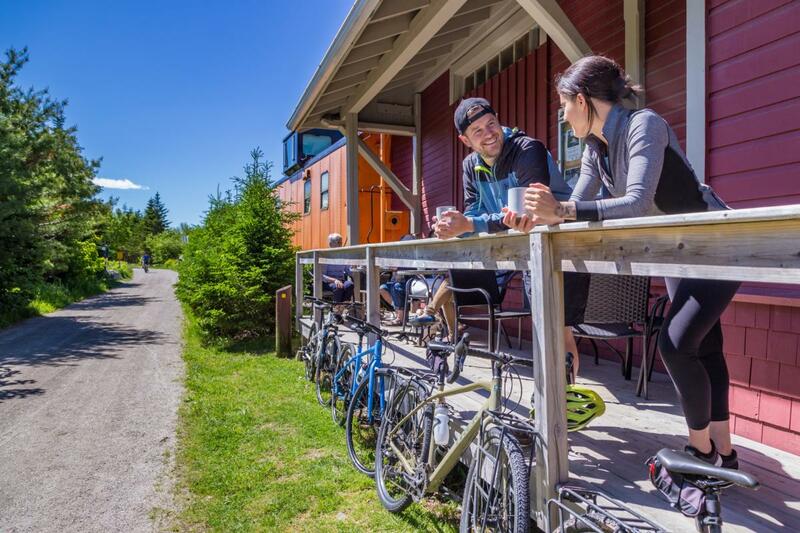 Local favourite, Train Station Bike and Bean (km 27) in Upper Tantallon is a heritage train station that has been cleverly converted into a café and bike shop. The Aspotogan Trail starts in the seaside community of Hubbards (km 52), home to Nova Scotia’s last great dance hall, the Shore Club (check shoreclub.ca for Lobster Supper and Live Music nights). The Trellis Café in Hubbards is a great option for any meal with its hearty local dishes and close proximity to the trail. Head back toward Halifax from the trailhead a short distance on Hwy 3 to access Hubbards’ amenities. Continue on Hwy 3 to Shore Club Road to get to the Shore Club. West of Hubbards, the trail heads inland across the Aspotogan Peninsula, offering a few picnic stops next to lakes and rivers. When you reach the coast again, you can cool off at Meisner’s Beach in East River Point, accessed by a 1 km ride on Hwy 329 where the road crosses the trail (km 64). Grave’s Island Provincial Park in East Chester is also in the area. Exit the trail by turning left onto Duncan’s Road (km 73), then right onto Hwy 3. Graves Island Road will be on your left. From East River, follow the Chester Connection Trail to the z Village of Chester (km77). Strolling through the Village, you’ll find studios, galleries and restaurants, like The Kiwi Café and Rope Loft. The Chester Connection continues toward the community of Western Shore (km 91), crossing a large trestle bridge over Gold River. To enter the community of Western Shore, several roads crossing the trail lead down to Hwy 3 (the main road through the community). Overlooking one of the world’s most famous treasure hunts on Oak Island, you can unwind at Oak Island Resort . Enjoy restaurants, pools and spa, or rent a kayak. Back on the trail, it’s a graceful ride through woodland and across the Martin’s River trestle bridge before the trailhead for the Dynamite Trail (km 100). Make sure you stop at the interpretive panels and enjoy the scenic Oakland Lake (km 104) before reaching Mahone Bay. To reach downtown Mahone Bay, turn left on Main Street (km 108). Take a walk through the downtown, stopping at Sweet Ride Cycling and the many beautiful gift shops and delicious cafes and restaurants. Take a tour of Amos Pewter to learn how their locally inspired, hand-crafted jewelry, ornaments, and keepsakes are created. The 10km Bay to Bay Trail connects Mahone Bay to Lunenburg (km 119). You can enter the town by turning left on Dufferin Street, right on Falkland Street, and left at the first crosswalk to access a trail to the waterfront. Old Town Lunenburg is a UNESCO World Heritage Site and a bustling community with many shops, artisans, restaurants, attractions, grand heritage inns and B&Bs, and the Rhumb Line Bicycle Shop.